Some people find licorice a palate-pleasing flavor in items ranging from colorful candy to after-dinner liqueurs. Also called anise, licorice extract finds a home in some kitchens alongside other baking extracts such as vanilla and peppermint. Not as well known as its sweet taste are the syrupy liquid's medicinal properties, including its ability to promote healthy, even-toned skin as an ingredient in personal care products. Licorice extract has been used for its health benefits as far back as ancient China, and it is an ingredient in some over-the-counter cleansers, toners, face creams and spot treatments. The syrupy juice from the herb's root contains beneficial plant sterols, which promote skin elasticity and fight inflammation and wrinkle formation. Licorice extract also contains glycyrrhizin, an acid that plays a role in increasing steroid hormones that naturally occur in skin. Glycyrrhizin helps to combat several skin disorders that respond to topically applied hydrocortisone. Licorice extract also can help soothe irritation caused by some skin-care products and medications. Body cleansers, body creams and facial skin-care products that incorporate licorice extract have effectively treated skin disorders such as rosacea, eczema, psoriasis and dermatitis. Licorice extract is anti-inflammatory. Inflammation is the body's natural attempt to protect itself by expelling infection and irritants from the body, and it shows up on skin in symptoms such as redness, rashes, itching and swelling. Licorice extract effectively addresses these conditions in concentrations as low as 1 to 2 percent. Consistent use of licorice extract over time has been known to fade dark spots and blemishes, and lighten skin. It can also reverse darkening of scars, which are fibrous skin tissues that remain when an injury hasn't completely healed. Licorice extract is also a good natural substitute for hydroquinone, which causes adverse reactions in some users. An ingredient called glabridin helps reduce uneven skin darkening -- also known as hyper pigmentation -- caused by exposure to the sun's ultraviolet rays. Glabridin is an active ingredient containing five flavonoids that act to depigment, or lighten, skin while blocking an enzyme that causes damaged skin to darken. Potent antioxidants in licorice extract fight skin-damaging free radicals. 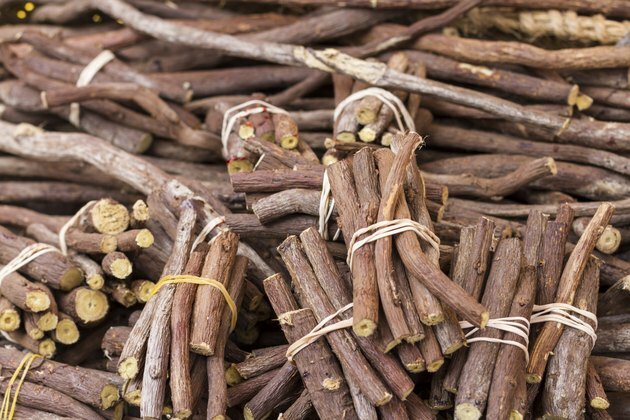 Licochalcone, another ingredient in licorice, helps to regulate the skin's oil production, making it useful in anti-acne skin-care regimens, as some zit outbreaks are the result of pores being clogged by overly active oil glands. Although licorice extract has many benefits, there are some cautions. Avoid product contact with the eye area, and when checking product labels, remember that licorice extract might be listed as dipotassium glycyrrhizate. MedicalNewsToday.com: What is Inflammation? What Causes Inflammation?